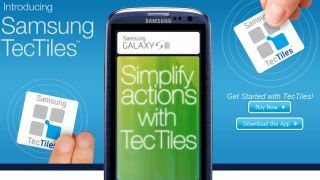 Samsung has announced its new programmable NFC tag system, with the TecTiles app and NFC enabled tags now available to customers. Following in the footsteps of LG's Tag+ and Sony's SmartTag systems, Samsung is the next mobile manufacturer to embrace this area of NFC technology. The programmable tags (read: stickers) allows users to set commands on them, so when an NFC enabled phone is swiped over it, settings are changed/actions are performed on the handset. Samsung has made a wide array of functions available to the TecTile system, including automatic Facebook likes, Foursquare checkins, calling and messaging functions and changing various phone settings. You will be able to combine multiple actions into one tag, for example turning on Wi-Fi, enabling silent mode and turning on Bluetooth when you tap a sticker. To take advantage of the TecTile system, you'll need a NFC-enable phone, such as the Galaxy Nexus and Galaxy S3, although you can use handsets from other manufacturers too. You'll also need to download Samsung's free TecTile app from Google Play to use the tags. There is an additional cost though, which are the tags themselves. You can pick them up direct from Samsung's US store, but they will set you back $14.99 (around £10) for a pack of five. Considering LG and Sony both give away a few free tags with some of their handsets, this seems a little steep. With three major handset manufactures now playing the NFC tag game, we contacted HTC to find out where it has plans to join in. Sadly, we got the following response: "HTC One X and HTC Desire C are both NFC enabled, but HTC doesn't comment on future product roadmap offerings."